Martin-Lopez, et al. 2012. Uncovering Ecosystem Service Bundles through Social Preferences. PLoS One. In this paper the authors investigate the ES bundles and trade offs from a social perspective. ES bundles are sets of ES appearing together in the landscape and trade offs arise when the provision of one ES is enhance at the cost of another. In this sense the use of bundles is explained by looking at preferences of different social groups towards ES in different ecosystems through an extensive face to face interview process. The findings are that different groups of people are related to ES in different ways, with variables like level of formal education, environmental behavior and gender being the most influential in the probability to recognize the provision of ecosystem services (for example women appear to value regulating services more highly than men). They also found a clear tradeoff between provisioning services versus regulating services and almost all cultural services. They identified bundles of ES mainly associated with the conservation management strategy and the rural urban gradient. The contribution of this study is that the authors empirically demonstrate that the value of ecosystem services depend on the people that is benefiting on them deepening the understanding of what type of stakeholders values what types of ES. Willemen, et al. 2012. A multi-scale modelling approach for analysing landscape service dynamics. Journal of Environmental Management 100, 86-95.This paper presents a conceptual and methodological approach to assess the spatial and temporal dynamics of ES supply in function of regional societal demand and the management of landscapes. Here, all processes and interactions are assumed to take place in three levels: the level at which ES are supplied (local), the level at which demand is represented in policy targets (regional) and the level at which land is actually managed (management unit). The modeling approach consisted in three steps: the quantification of the ES at the local and regional level, defining ES demand at the regional level and allocating land management per management unit. Overall this approach focuses on the exploration of solutions to meet the demand for ES determined by regional policy targets. They translate the resulting conceptual framework into an operational model using a rural region in Netherlands as a study case simulating changes in three ES (plant habitat, arable production and cultural heritage) supply by regional actual policies. The contribution of this type of study is that identifies and quantifies temporal and spatial dynamic patterns of multiple ES, including multiple uses of a single location and show potential for quantitative assessments of ES for policy discussions on landscape management. Holmquist, et al. 2010. To restore or not? A valuation of social and ecological functions of the Marais des Baux wetland in Southern France. Ecological Economics 69: 2383:2393. In this paper, they use “Choice Experiment” to see the preference of local people in the decision of wetland restoration. By given multiple plans which are including wetland’s ecosystem services (provisioning, supporting, cultural services), the results show that most people prefer to restore the wetland in only one third size of the wetland. The control of mosquitoes is necessary to the local people and is better under biological control than chemical one. The recreational facilities and more trees to defend against wind are needed. This paper also indicates that high biodiversity is essential to bring up people’s environmental concerns. Macfayden, et al. 2012. Managing ecosystem services and biodiversity conservation in agricultural landscapes: are the solutions the same? Journal of Applied Ecology 49: 690-694. In light of the premise that biodiversity conservation and agriculture are traditionally conflicting, this paper reviews published examples of management in agricultural landscapes for biodiversity and ecosystem services. They outline a number of asymmetries involved. First, the type of taxa normally considered in agricultural ecosystem service management are microbes and invertebrates, occasionally non-native species (particularly in the case of biological control), whereas biodiversity is focussed more on a variety of native species. Furthermore, they note the level of biodiversity considered is often much lower in ecosystem service management (often one or few species) compared with biodiversity management. Second, spatial scales are often very different, small and local in ecosystem service management, and large or regional when considering biodiversity. Third, there are often different shares of costs and benefits to private and public stakeholders, both direct, and through incentive schemes (e.g. PES). Overall, these asymmetries mean that biodiversity management does not automatically beget ecosystem service provision, and vice versa. While this throws a shadow on our hopes of “win-win” outcomes, accepting it is likely to avoid disillusionment and ultimately result in better outcomes for all. Lautenbach et al. 2010. Quantifying ecosystem service trade-offs. International Environmental Modelling and Software Society 2010 International Congress on Environmental Modelling and Software, Ottowa, Canada. This paper contrasts three options to compare trade-offs between ecosystem services, including map comparison, scenario analysis, and trade-off analysis using optimized landscapes. Map comparison involves, for example, simple, usually pair-wise correlations and congruence between services based on spatial location. These are usually land cover based / static models, and this method examines patterns, but often the mechanisms and processes defining and resulting in trade-offs (i.e. outcomes under different decisions) are not readily observable with this method. Scenario analysis and optimisation can help to reveal some trade-offs, particularly when based on process models. However these usually come at a cost of research time and effort, and need to balance pragmatic decisions of model complexity, realism and processing time. This paper would have benefited by following the same example though the case studies: as it stands it is difficult to evaluate the real benefit (net of the costs) of the additional effort. Also, while we did not discuss it on the day, we note the recent arrival to the on line literature: Crossman et al. 2013. A blueprint for mapping and modelling ecosystem services. Ecosystem Services. http://dx.doi.org/10.1016/j.ecoser.2013.02.001. 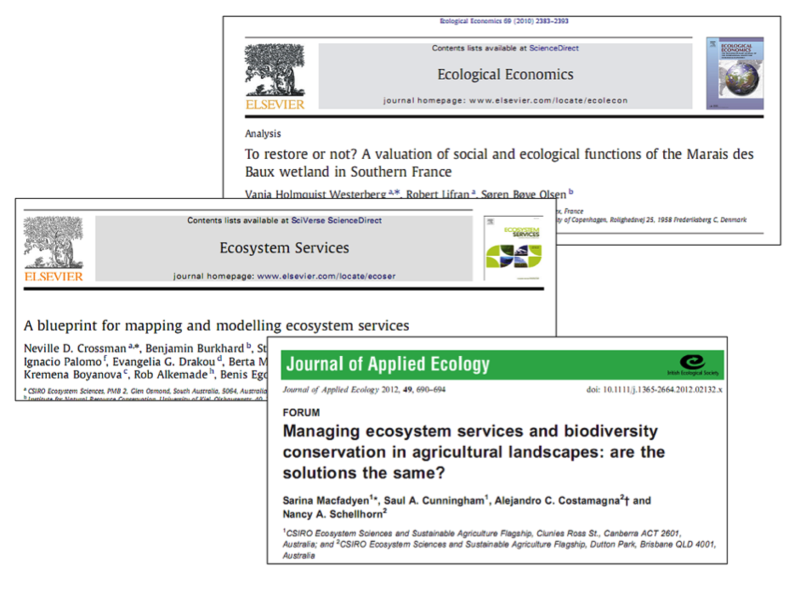 The latest review paper of mapping ecosystem services, it is possibly a good introduction into the many papers (and other review papers) that look at the very diverse methodologies to map and model ecosystem services, looks to have come out of a workshop at the last Ecosystem Services Partnership Conference. And that is a lovely segway into some shameless self-promotion: we are going to be holding a workshop/open session at the next Ecosystem Services Partnership Conference (http://www.espconference.org/ESP_Conference), to be held in Bali, in August. It is called “What decision makers need: scenario driven, systematic decision making and policy analysis for multifunctional landscapes”. Integrating ecosystem services into holistic landscape planning requires consideration of synergies and tradeoffs in multifunctional landscapes. To show how this challenging task is being addressed, we will discuss and showcase several case studies that develop and extend diverse toolsets and approaches for integrating ecosystem services into land-use decision making at various scales of governance, in contrasting biomes, and anthromes. Hope to see you in Bali! March 28, 2013 in Publications.